HALIFAX -- Beneath the choppy waves off Nova Scotia's rugged coast are thousands of shipwreck sites sprinkled with lost treasure: centuries-old coins, canons, and perhaps even historic booty stolen from the White House. Treasure salvagers who once spent millions of dollars exploring such sites say provincial laws are preventing shipwrecks from being scoured in any meaningful way -- and that the region has become somewhat of a wild west for so-called pirate divers. "Nothing would lead me to believe that these sites are safe from being looted," said Jeff MacKinnon, a third-generation treasure hunter from Cape Breton. "It's too enticing for some people not to look." Under the Treasure Trove Act -- the only legislation of its kind in North America at that time -- commercial underwater explorers would conduct undersea archaeology and remove precious stones and metals from the ocean floor. A key find came in 1965, when divers recovered about $500,000 in gold coins and artifacts from Le Chameau, a French payship that sank near Louisbourg, N.S., in 1725. The province touted it at the time as a way to "preserve and protect Nova Scotia's underwater cultural and heritage resources," after a task force raised questions about whether private firms should be allowed to conduct salvage operations and recover artifacts. But many who work in the industry say it's had the exact opposite effect. "The province has got such a special resource through these shipwrecks. I can't believe they just cut it off and left it for dead in the water without a backup plan," said Duane Dauphinee, a Halifax-based diver who has worked around the world on underwater archaeology projects. "They had no plan to go forward, which meant in a province that doesn't have a lot of money for this type of thing, it's just going to die... By killing the act, they are leaving everything that would have been recoverable in the water forever." MacKinnon, who has not hunted for treasure since the act was repealed, said there's nothing stopping treasure salvagers from illegally diving because there is no incentive to report any findings and no effective way of policing offshore underwater sites. Dauphinee added that anything brought up to the surface illegally just "sits in their basement." "By having the province verify what we had, that's what made it worth your while," he said. "If you can tell where it's from, what it is, and if it's of historical significance, it could be worth 10 times or a hundred times more than what it is as a gold coin." Shipwrecks are now protected under the province's Special Places Protection Act. The province said underwater artifacts should be left in situ, and archaeology at these sites is only permitted with a Heritage Research Permit. Heritage Department spokeswoman Lynette MacLeod said 31 heritage permits with an "underwater/marine component" have been issued since 2011. "In many cases, it is not always practical to collect every artifact from a site and rather than remove objects, archaeological sites are properly documented," said MacLeod in an email statement. "The treasure law before it was repealed had a lot of good," Sinclair, one of the first professional archaeologists to visit the Titanic site off Newfoundland, said from Richmond, Virginia. "It was a way to work together with people who were genuinely interested, and who wanted to spend the time, the resources, and not to mention life and limb, getting out there on what's often an unkind sea and bringing these remnants of humanity's past to the surface." MacLeod said the province is "planning to review the Special Places Protection Act as part of Nova Scotia's Culture Action Plan, including reviewing underwater archaeology." 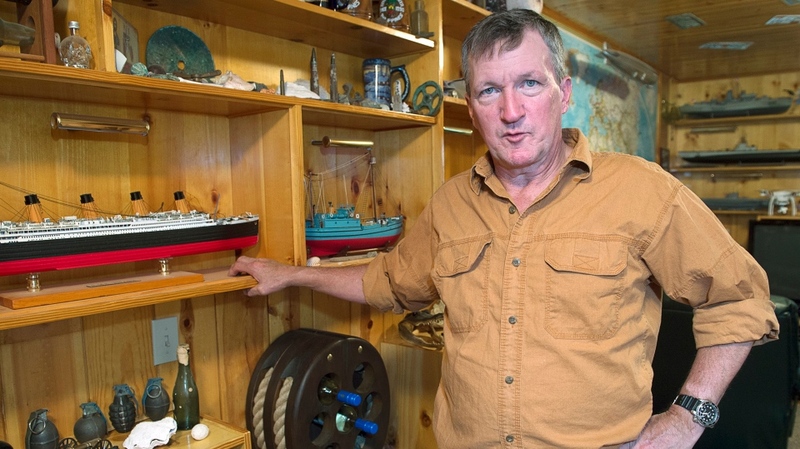 Roger Marsters, curator of marine history at Halifax's Maritime Museum of the Atlantic, acknowledged that shipwreck sites are likely being scoured illegally. "They could do important work with the diving community, helping to educate the diving community, but also engage the diving community in managing these resources responsibly," said Marsters. Meanwhile, treasure hunting is being carried out with great fanfare on Nova Scotia's south shore on Oak Island, the subject of a popular History channel television show, "The Curse of Oak Island." The provincial act that regulates that project -- the Oak Island Act -- was enacted after the Treasure Trove Act was repealed to allow work on the small island to continue. MacKinnon believes it's unfair that treasure hunting is allowed to happen on Oak Island while other, perhaps even more culturally significant sites, sit largely unexplored on the ocean floor. He said it's also a missed opportunity, given the commercial success of the television show. There are plenty of known sites that could make for their own television shows or documentaries, and in turn, promote the province and ultimately boost tourism, he said. MacKinnon fears that collection will never grow. He's urging the government to resurrect a version of the Treasure Trove Act. "Taxpayers are not going to pay money to recover shipwrecks. They'd rather put their money into health care or better education for their children, so why not work with the private sector to recover these wrecks?" he said.